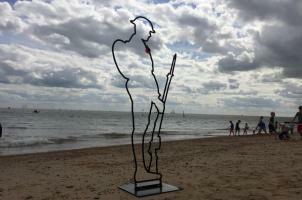 A series of commemorative events are being planned in Clacton to mark 100 years since the end of the First World War. Up and down the country a special effort is being made for this landmark occasion on November 11, and Clacton is no exception. The town’s commemorations will begin on Saturday, November 10, when the East Essex Aviation Society (EEAS) will from 9am construct a full-size replica of a First World War tank in the Town Square. Expected to take around five hours to build, at around 3pm there will be a short inspection of the tank and society members – in replica uniform – by Tendring District Council (TDC) Chairman Mark Platt, along with a piper. The EEAS team will then stay with the tank overnight, and members of the public are welcome to stop by and meet the team and view the tank. At 6am on Sunday, November 11 at Clacton War Memorial, piper Charlie Jones will join more than a thousand other pipers across the world who are simultaneously playing the traditional ‘Battle’s O’er’ piece of music. Throughout the day the Lemmings Theatre will be taking part in the Pages by the Sea art project, a national initiative led by film director Danny Boyle and part of the Imperial War Museum’s 14-18 Now project. Between 9am and 1pm stencils will be used to create images in the sand on West Beach, below the 1920’s Garden, which will be washed away as the tide comes in. There will also be music and poetry during the creation of the visual tableau. The annual Remembrance Parade will begin from Clacton Town Hall at 10.25am. Led by parade marshal Jamie Robinson and the Colchester Scout Band, dignitaries will take a salute before the procession goes past the replica tank on the Town Square and down to the war memorial on the seafront. A service will be led by Reverend David Lower, with hymns accompanied by the Salvation Army Band, and a silence. Cllr Platt is also lighting a beacon at The Naze, in Walton, at 7pm on Remembrance Day, as part of the national Beacon of Light Battle’s Over event. Activities, including music and The Last Post, begin from 6.30pm. There also due to be beacons lit at Holland Haven, Ardleigh, and Harwich, and many parishes will be holding their own Remembrance Day commemorations. Cllr Platt is encouraging people to come along to the events, and the parade in particular, on what is a truly important occasion. “It is important that we remember those who sacrificed their lives in the First World War, and all conflicts, every year – but this year, being the 100th anniversary, will be particularly poignant,” Cllr Platt said. “Every year Clacton turns out in force to watch the parade and join our Remembrance Service, but I would ask that in 2018 everyone makes an extra effort to come and show their respect. Commemoration events by other organisations are also taking place around Clacton and the district. These include workshops at Clacton Library as part of the Pages by the Sea project, on November 3 from 10.30am-12noon with storytelling and poppy making, and on November 10 from 10am-12noon with a poetry session with Anita Belli. Poppy sales by the Royal British Legion are underway, and are being sold right up until November 10 at a number of locations around the town, including supermarkets and the town centre.